An easy to build 4-channel mixer/attenuator with 2.0x gain and 5V offset on each channel in an 8hp module. Ampmix was designed as a handy CV mixer and processor with buffered inputs and outputs but it will also work great with audio, even with full gain. If you patch OUT1 to IN2 the chaining of channel 1 and 2 will provide 4x gain. If you also patch OUT2 to IN3 at the same time you get a total of up to 8x gain from the chaining of channel 1,2 and 3. Also if you patch OUT3 to IN4 at the same time it adds up to 16x gain chaining all 4 channels. You can chain any combination of channels it doesn’t have to be in the described order. An offset voltage is generated then normaled to the inputs of the 4 channels, giving them a maximum of 5V out each with knobs turned full clockwise (2.0x gain). Please note that these offsets will affect the mixing if the channel hasn’t been patched on its input or output, so turning all unused channels fully counter-clockwise/left (off) is advisable for a clean mix. With up to 2.0x gain on each channel, chainable for greater gains. 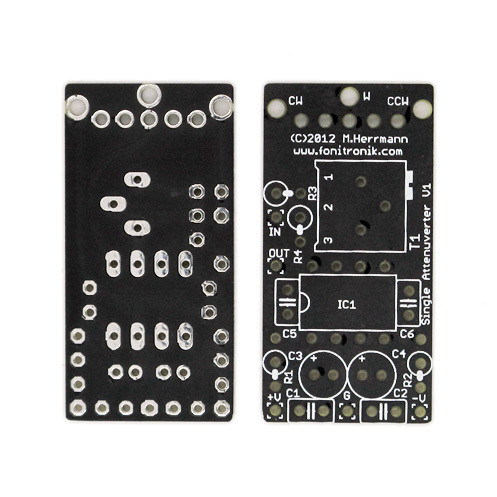 The Ampmix Kit is a novice-friendly project, it is a low part count, single-PCB build that only requires the most basic experience in PCB soldering and module assembly. Kits comes supplied with PCB, front panel (PCB material), component kit, knobs, power cable and mounting screws. Solder and tools are not supplied.